Since December 1st I've been thinking about how I will wrap my packages this year...staying on the same track as my holiday decorations, I used items I already have around the house and stayed with a very simple theme. I spent about an hour looking in my pantry, desk for office supplies and even the garage for twine and string. For wrapping paper I used kraft wrap and a roll of white paper we've had around forever that my kids use for school projects. The kraft wrap is sold in drug stores, but the best kind is sold at Olive Manna. It's a little thinner and makes wrapping a dream. Spools of twine and an assortment of tags I've purchased over the years at old fashioned stationery stores, art supply stores and even Staples. Most of my supplies are stored inside my desk/armoire in silver boxes purchased at Ikea. Next year I would like to find a spot in our house to have all of this set up on an old table or desk...out of the way, but not too far. 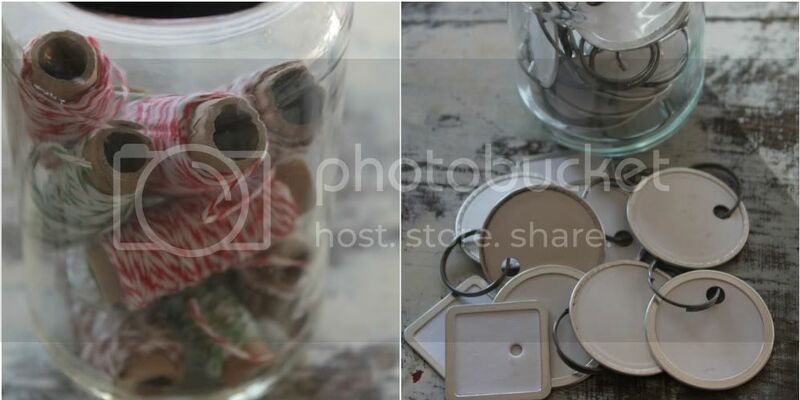 Jars of buttons, tags, twine, mini clothes pins, markers and stamps. 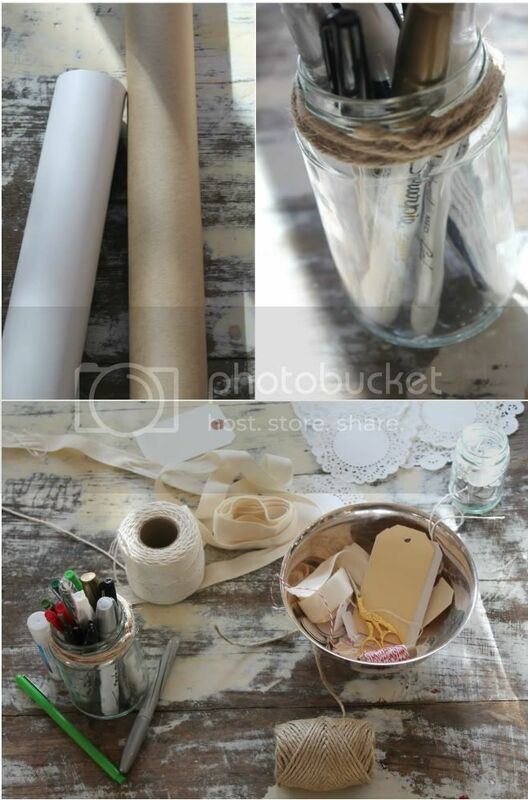 It will look festive and be perfect to wrap a hostess gift at the last minute. Annie, you are so incredibly talented! These are so absolutely beautiful, what a delight to find underneath the tree. Really beautiful, Annie. I was thinking along the same lines. I'm trying to remove the modern commercial qualities of Christmas and move toward things that are more natural and traditional. Think Little House on the Prairie. These are some perfect images and ideas. Annie! We totally think alike! I just had my husband purchase me the same brown paper today as I wanted to go "green" with my Christmas wrapping this year. I thought the kids could have fun as well and decorate some of the packages with pictures, poems etc! Those are some packages I would almost not open because they are wrapped so perfectly! Very simple but great! Stop by, I am having a great Christmas giveaway! Brilliant, as usual! I love the mosaic of presents at the top. I would love to have a dedicated wrapping/packing station all year round, I get jealous of the set up they have at the Fed Ex store. Lovely! ESP. 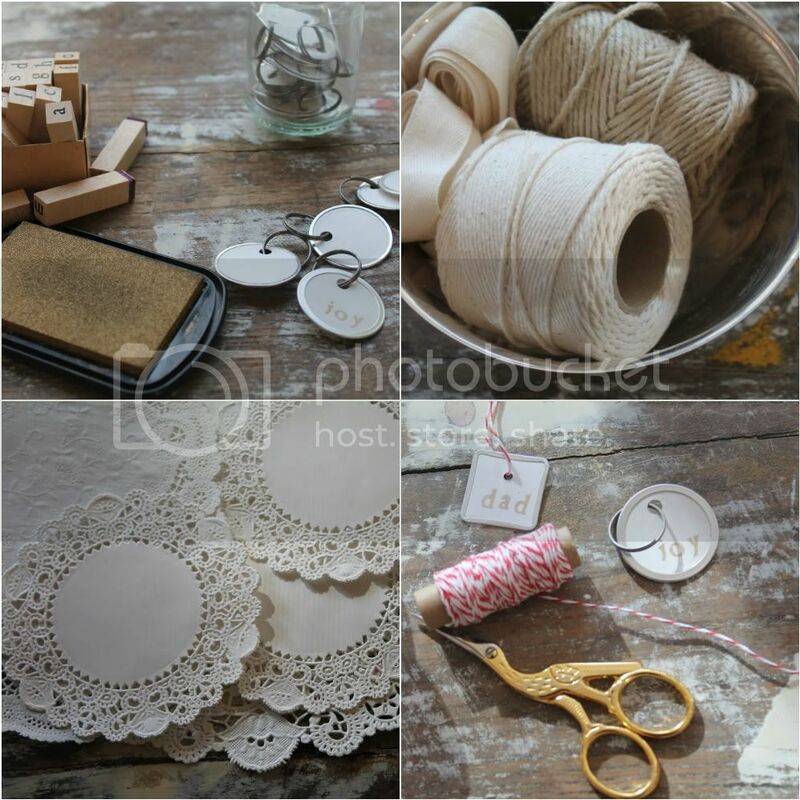 The button and striped twine! How beautiful! I've always love brown paper packages, and you've made them just beautiful! This is my kind of wrap! I recently bought a large roll of lightweight kraft paper with a subtle pin stripe and plan on using it for my gifts this year. Adore the scissors. Where did you find them? They are so pretty and special. These parcels look absolutely delightful.You are so skilled. And, as you say, the elements can be arranged and rearranged in many different combinations whilst retaining the same theme. So clever!! 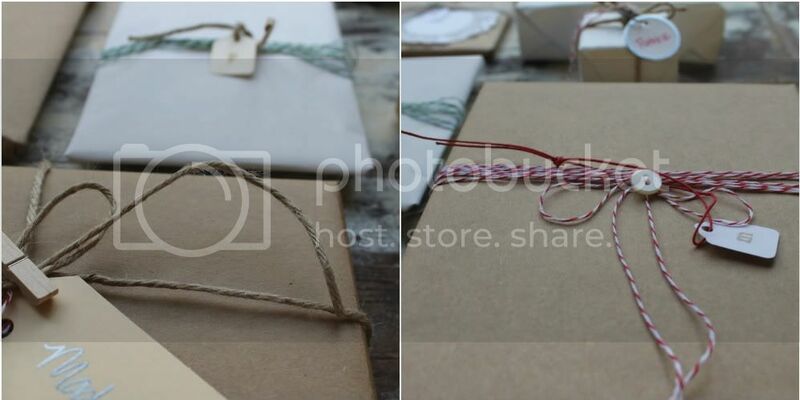 I love wrapping gifts with Kraft and twine. But you took it up a notch with the sweet little touches! Love the clothespin idea!! I love the way that you have decorated those packages. They look very pretty, almost too pretty to open. The perfect packages! The Brown & White wrappings look so clean and crisp in an decor! The button is a sweet touch, and the different size twine adds to the interest! Love the tags! While on a Christmas home tour last weekend, my favorite home had gifts wrapped in brown paper with red or white satin ribbons and a small evergreen sprig! As lovely as yours! Lovely! I'm using brown paper and red/green ribbon this year. People who I have already given gifts to have commented on how simple and lovely the wrapping is. Sometimes less is more isn't it?! I love the elegant simplicity of your wrapping. 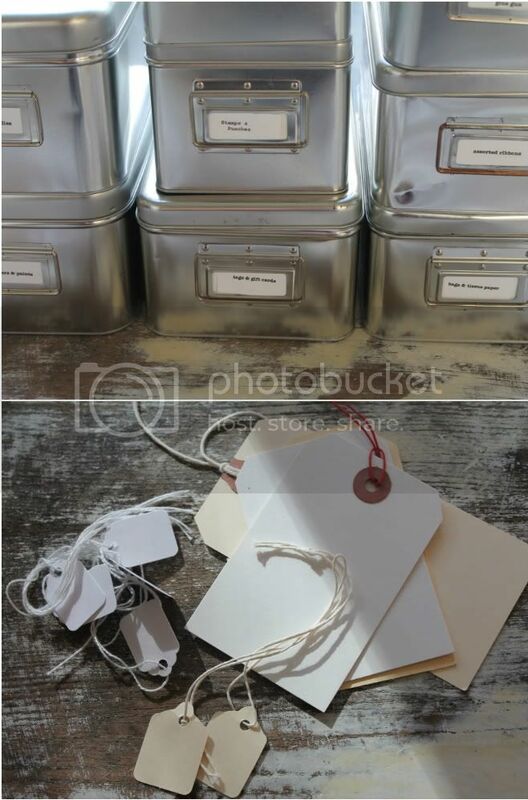 Good idea about collecting tags over the years so that you have an assortment...not just one kind. I am keeping this in mind now! Oh Annie, over here conservatories were built onto every single house in the 1970's - they are eyesores trust me! My uber wealthy neighbour however has an original one built in 1870 - thats is breathtaking. Oh goodness Annie! I have so much to catch up on here! These are all so pretty! I've bought some wrapping supplies Olive Manna before and love them. I recently bought some craft paper in the paint section of Lowes. Um, it is insanely cheap for about a lifetime supply! It is thick though. i mixed in craft paper this year and love it. love the stamp on the tags...lovely.